Jupiter, along with its set of satellites and atmosphere, is a pint-sized system within our solar system. The moon is a floating asteroid in space, which is captured by the gravitational pull of the planet. It is also well-known that the Jovian planets which are made up of ice and gas have more moons than the terrestrial planets like Mercury, Venus, and Earth that are made up of rocky materials. The close distance of the terrestrial planets with the sun leave Mercury and Venus moonless. Now, the curiosity to find other major destinations in our Milky Way, maybe with a possibility of life, have taken astronomers to deep space. 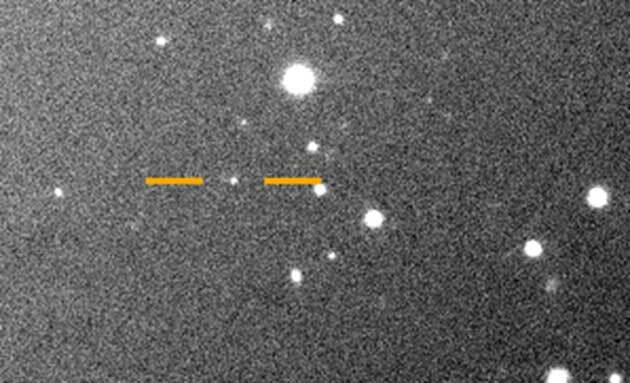 It was a matter of chance that Jupiter came into the survey field of the research, conducted by Scott S. Sheppard and his team from Carnegie Science Institute, to look for “Planet X” (as it was called). The technology used in the telescope was Dark Energy Camera that is specialized in contemplating the night sky for faint objects. The study was confirmed by Carnegie’s Las Campanas Observatory in Chile using the 6.5-meter Magellan Telescope, Lowell Observatory Arizona using the 4-meter discovery channel Telescope, 8-meter Subaru Telescope and an 8-meter Gemini telescope in Hawaii. Jupiter has a magnetic field which is 20,000 times higher than that of Earth, due to which there are swarms of charged particles around it. All its moons and rings are present in a dense radiation belt of electrons and ions in this magnetic field. Galilean Moons: Jupiter’s four largest moons are known as Galilean Satellites. They are Lo, Europa, Ganymede, and Callisto. Among these moons, Europa seeks a lot of attention as its surface comprises of icy water. Scientists are very curious to explore if, along with the presence of water, these moons also have other habitable conditions. The structure of Galilean moons is layered like that of Earth, i.e., it has a core and mantle. Prograde and Retrograde Groups: They are formed on the basis of orbit behavior of the moons. The moons from both these groups are formed from a larger parent body, respectively. Prograde is the group of moons orbiting Jupiter on the inner side with same orbital distances and angle of inclination towards the planet. Out of the twelve new moons, two are in this group. Retrograde, on the other hand, are the other nine newly discovered moons. In this group, the moon's orbit is in the opposite direction as of Jupiter’s spin rotation. Amidst these moons, there is also an "oddball," which has a peculiar orbit behavior. It is also the smallest moon of Jupiter and can be categorized in the prograde group, but its orbit crosses the outer retrograde orbit. This unusual moon has been given a provisional designation of S/2016J2 (Valetudo) on July 17, 2018. The green orbit in the above images represents Valetudo. 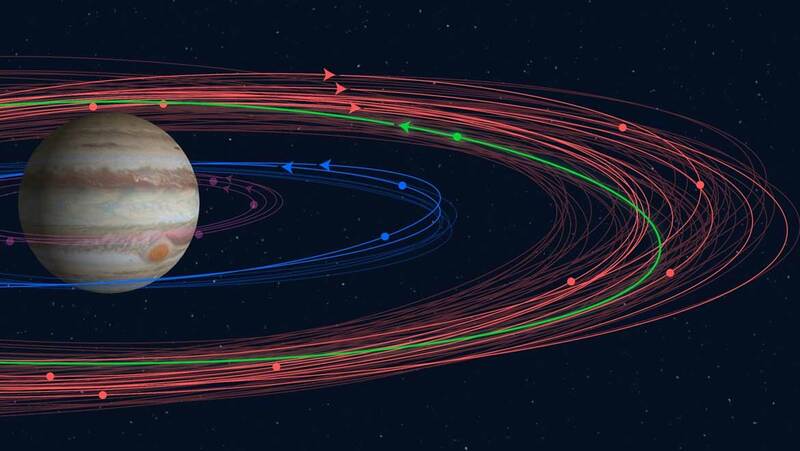 This incidental discovery not just helps astronomers understand Jupiter better, but it also opens up new avenues to understand our solar system better. According to scientists, these orbiting moons are formed due to the collision of parent moons, which were formed after the planet formation phase, following the Big Bang. The orbital history of any moons can help explorers understand the fuzzy and complex behavior of various cosmic bodies. On the other hand, Valetudo could be in a very unstable situation. Being in the prograde group, this moon is orbiting in the outer retrograde area with other bodies moving in the opposite direction - a "one-way zone," so to say! The probability of a head-on collision for Valetudo, while orbiting Jupiter, has been calculated to be very high. Research questions, like when this collision will happen and with which other planetary bodies, could be further explored. The next major mission to explore Jupiter’s moons is NASA’s Europa Clipper. Clipper will conduct detailed scrutiny of Europa to see if life is indeed possible on Jupiter’ moon.